Martin Eden is about a young proletarian autodidact struggling to become a writer. It was first serialized in The Pacific Monthly magazine from September 1908 to September 1909 and published in book form by Macmillan in September 1909. Eden represents writers' frustration with publishers by speculating that when he mails off a manuscript, a "cunning arrangement of cogs" immediately puts it in a new envelope and returns it automatically with a rejection slip. 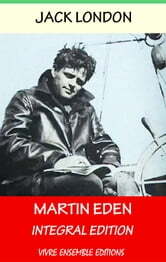 The central theme of Eden's developing artistic sensibilities places the novel in the tradition of the Künstlerroman, in which is narrated the formation and development of an artist. Eden differs from London in that Eden rejects socialism, attacking it as "slave morality", and relies on a Nietzschean individualism. "One of my motifs, in this book, was an attack on individualism (in the person of the hero). I must have bungled, for not a single reviewer has discovered it." Living in Oakland at the beginning of the 20th century, Martin Eden struggles to rise above his destitute, proletarian circumstances through an intense and passionate pursuit of self-education, hoping to achieve a place among the literary elite. John Griffith "Jack" London (born John Griffith Chaney, January 12, 1876 – November 22, 1916) was an American novelist, journalist, and social activist. A pioneer in the then-burgeoning world of commercial magazine fiction, he was one of the first fiction writers to obtain worldwide celebrity and a large fortune from his fiction alone. London was part of the radical literary group "The Crowd" in San Francisco and a passionate advocate of unionization,socialism, and the rights of workers. He wrote several powerful works dealing with these topics, such as his dystopian novel The Iron Heel, his non-fiction exposé The People of the Abyss, and The War of the Classes.
" Vivre Ensemble Editions " are dedicated to offer you a comfortable and enjoyable reading of books on your e-reader. All our books are carefully designed, with a table of content.